Some of the difference can be attributed to familiarity. Employees see and talk with their supervisors every day, but may rarely (or never) have a conversation with higher ranking leaders. Regardless of the reason, the fact is that employees are reporting they do not have great trust and confidence in their leaders and the numbers are heading in the wrong direction. Some of the numbers are shocking. 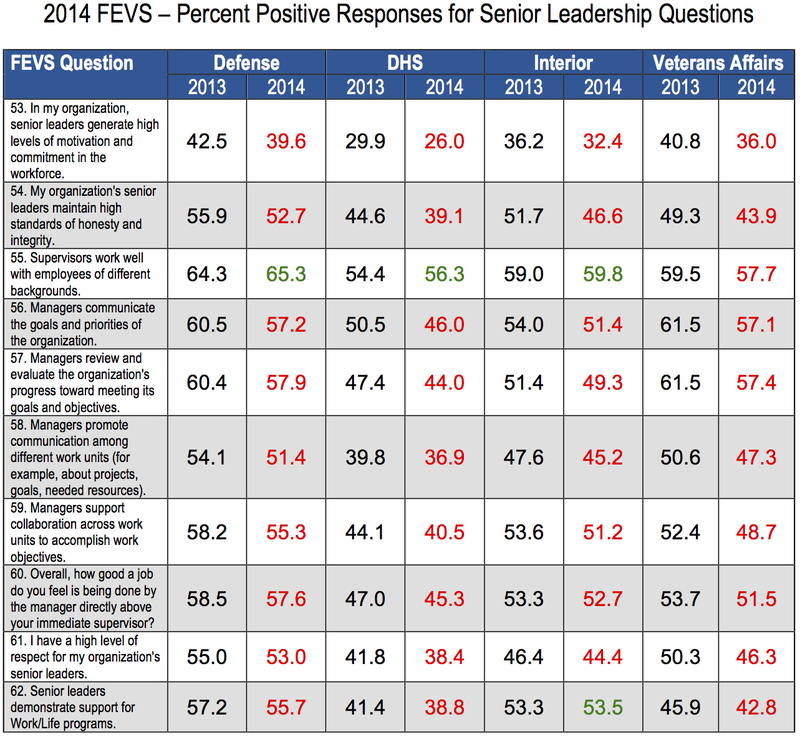 Only DoD was able to muster more than 50% positive responses for “I have a high level of respect for my organization’s senior leaders” and “Managers promote communication among different work units.” None of the agencies broke 60% on “Managers communicate the goals and priorities of the organization.” Think about that. How can an employee work to accomplish the agency’s goals if managers do not communicate what they are? Do we expect them to just stumble blindly into accomplishing them? Not knowing where the agency wants to go is just one of the consequences of the trust and confidence issues the FEVS reveals. Mister Rogers was right – we have to create an environment where people want to work. A workforce that does not think much of its leaders can be pushed only so far. It will eventually have problems with productivity, recruiting high quality talent, customer service and other factors that are driven by employee engagement. Trust and confidence in leadership can also be a leading indicator that presages drops in other FEVS questions. If this trend continues, it is likely to drag all of the results even farther down. At some point, maintaining morale and productivity will become increasingly difficult. The downward spiral has to be stopped soon. Stopping it will take concerted actions by the key players. Here are a few ideas that should be considered. Link manager and executive performance goals directly to agency strategies and objectives. One reason managers do not adequately communicate goals and priorities is that many of them do not have performance plans that are tied to the overall agency objectives. If manager performance plans always contained that type of linkage, managers would have a more personal stake in communicating those goals to their subordinates. Failure to communicate would decrease the probability that they could accomplish the objectives in their performance plans. Conduct regular reviews of the organization’s progress in meeting goals. When I was HR Director for the Defense Logistics Agency, I implemented a monthly In-Progress Review for all of our critical programs. The first few were rough – they came in barely aware of the status of their programs and unprepared to discuss anything in detail. After a few painful meetings, people came in ready to discuss status, issues they were facing, support they might need, and any problems that needed to be addressed. We went from struggling to implement programs to being able to successfully develop and deploy new initiatives. Create cross-functional and cross-organizational teams as a normal operating process. Too many organizations tolerate stovepipes that operate as though they are islands. Those stovepipes will never go away on their own. They are too comfortable for their inhabitants and give some managers a sense of control and power. Sharing information is viewed as weakening that power. The truth is that sharing information makes the entire organization more effective. Agencies can improve their performance by ensuring that program teams have representation from multiple organizations with diverse skill sets and views. Invest in Leader Development programs for managers and executives. “Supervisory training” is common in Federal agencies – usually taking the form of a 40-hour or less course that is heavily focused on the HR rules and policies managers need to know. That training is typically focused on new supervisors. Less common are programs that focus on improving the skills of managers and executives. I have heard too many people tell me “Senior Executives don’t need training.” Nothing could be further from the truth. The roles of executives and supervisors are different. We often assume that a newly-minted SES has all of the skills he or she needs when the new SES is wondering if s/he is the right person for the job. If we want to see improvements in how senior leaders are perceived, we have to develop those leaders. Do not exempt political appointees from leader development programs. Few agencies invest in training for political appointees. The Obama Administration has a program that provides appointees with an initial orientation, but once they get to their agencies, formal training is rare. Given the lack of government experience most appointees have, agencies should identify critical skills and conduct training to fill skill gaps. Hire better leaders. This may seem a bit too obvious, but 30+ years in Federal HR tell me it does not always happen. The very best leader development strategy is to hire leaders who need less development. Senior manager and executive vacancies should be filled using processes that focus on rigorous assessment of skills. Most selection processes have such questionable validity that they are only a little better than random chance. For example, most agencies use unstructured interviews. The correlation coefficient (a 0.0 – 1.0 measure of the relationship between the assessment and performance) for unstructured interviews is typically reported by researchers as being in the .20 range. Structured interviews and other more valid assessments techniques are more likely to produce selectees who are able to perform. Unless agencies begin to take steps such as these, it is unlikely we will see significant improvement in FEVS scores. They will continue to fall and the downward spiral will continue until the Federal government becomes a toxic workplace. We cannot afford to let that happen. Any chance you’ll be correcting the link to the DoD results PDF? It calls up a 404 error. Something appears to be not working on the DoD end. I switched to a cached version of the page from Google.